Although much is heard about the plight of the Palestinian refugees from the aftermath of the 1948 Israeli War of Independence and the 1967 Six Day War, little is said about the hundreds of thousands of Jews who were forced to flee from Arab states before and after the creation of Israel. In fact, these refugees were largely forgotten because they were assimilated into their new homes, most in Israel, and neither the United Nations nor any other international agency took up their cause or demanded restitution for the property and money taken from them. Legislation passed in the Knesset during 2015 designated November 30 as a day of recognition for Jewish refugees from Arab countries. In 1945, roughly 1 million Jews lived peacefully in the various Arab states of the Middle East, many of them in communities that had existed for thousands of years. After the Arabs rejected the United Nations decision to partition Palestine and create a Jewish state, however, the Jews of the Arab lands became targets of their own governments’ anti-Zionist fervor. As Egypt’s delegate to the UN in 1947 chillingly told the General Assembly: “The lives of one million Jews in Muslim countries will be jeopardized by partition.” The dire warning quickly became the brutal reality. Throughout 1947 and 1948, Jews in Algeria, Egypt, Iraq, Libya, Morocco, Syria, and Yemen (Aden) were persecuted, their property and belongings were confiscated, and they were subjected to severe anti-Jewish riots instigated by the governments. In Iraq, Zionism was made a capital crime. In Syria, anti-Jewish pogroms erupted in Aleppo and the government froze all Jewish bank accounts. In Egypt, bombs were detonated in the Jewish quarter, killing dozens. In Algeria, anti-Jewish decrees were swiftly instituted and in Yemen, bloody pogroms led to the death of nearly 100 Jews. In January 1948, the president of the World Jewish Congress, Dr. Stephen Wise, appealed to U.S. Secretary of State George Marshall: “Between 800,000 and a million Jews in the Middle East and North Africa, exclusive of Palestine, are in ‘the greatest danger of destruction’ at the hands of Moslems being incited to holy war over the Partition of Palestine ... Acts of violence already perpetrated, together with those contemplated, being clearly aimed at the total destruction of the Jews, constitute genocide, which under the resolutions of the General Assembly is a crime against humanity." In May 1948, the New York Times echoed Wise’s appeal, and ran an article headlined, "Jews in Grave Danger in all Muslim Lands: Nine Hundred Thousand in Africa and Asia face wrath of their foes." With their lives in danger and the situation growing ever more perilous, the Jews of the Arab World fled their homes as refugees. Of the 820,000 Jewish refugees between 1948 and 1972, more than 200,000 found refuge in Europe and North America while 586,000 were resettled in Israel - at great expense to the Israeli government, and without any compensation from the Arab governments who had confiscated their possessions. The majority of the Jewish refugees left their homes penniless and destitute and with nothing more than the shirts on their backs. These Jews, however, had no desire to be repatriated in the Arab World and little is heard about them because they did not remain refugees for long. In Israel, a newly independent country that was still facing existential threats to its survival, the influx of immigrants nearly doubled the population and a put a great strain on an economy struggling to just meet the needs of its existing population. The Jewish State, however, never considered turning away the refugees and, over the years, worked to absorb them into society. Overall, the number of Jews fleeing Arab countries for Israel in the years following Israel’s independence was nearly double the number of Arabs leaving Palestine. The contrast between the Jewish refugees and the Palestinian refugees grows even starker considering the difference in cultural and geographic dislocation - most of the Jewish refugees traveled hundreds or thousands of miles to a tiny country whose inhabitants spoke a different language and lived with a vastly different culture. Most Palestinian refugees traveled but a few miles to the other side of the 1949 armistice lines while remaining inside a linguistically, culturally and ethnically similar society. Moreover, the value of Jewish property left behind and confiscated by the Arab governments is estimated to be at least 50 percent higher than the total value of assets lost by the Palestinian refugees. In the 1950’s, John Measham Berncastle, under the aegis of the United Nations Conciliation Commission for Palestine, estimated that total assets lost by Palestinian refugees from 1948 - including land, buildings, movable property, and frozen bank accounts - amounted to roughly $350 million ($650 per refugee). Adding in an additional $100 million for assets lost by Palestinian refugees as a result of the Six Day War, an approximate total is $450 million - $4.4 billion in 2012 prices. By contrast, the value of assets lost by the Jewish refugees - compiled by a similar methodology - is estimated at $700 million - roughly $6.7 billion today. To date, more than 100 UN resolutions have been passed referring explicitly to the fate of the Palestinian refugees. Not one has specifically addressed Jewish refugees. Additionally, the United Nations created an organization, UNRWA, to solely handle Palestinian refugees while all other refugees are handled collectively by UNHRC. The UN even defines Palestinian refugees differently than every other refugee population, setting distinctions that have allowed their numbers to grow exponentially so that nearly 5 million are now considered refugees despite the fact that the number estimated to have fled their homes is only approximately 400-700,000. Today, nearly half of Israel’s native population descends from the Jewish refugees of the Arab world and their rights must be recognized alongside any discussion of the rights for Palestinian refugees and their descendants. In Israel, the issue of the Jewish refugees has been of preeminent importance during all peace negotiations with the Palestinians, including the 1993 Oslo Accords and the 2000 Camp David summit. Under the leadership of Prime Minister Benjamin Netanyahu and Deputy Foreign Minister Danny Ayalon, Israel is now calling on United Nations Secretary-General Ban Ki Moon to hold a summit specifically the issue of the Jewish refugees. In November 2014, the Israeli government dedicated November 30 of every year as a day to honor and remember the Jewish refugees who were expelled from Arab countries following 1948’s Arab-Israeli War. The legislation to dedicate this day to Jewish refugees from Arab countries was introduced by Knesset members Shimon Ohayon of the Yisrael Beytenu Party and Nissim Ze’ev of Shas. During an interview Ohayon stated that the aim of the legislation was to make sure that the younger generation is informed about this critical portion of Israeli history. The legislation also mandates an increase in coverage for these refugees in Israeli primary school curriculum. Ohayon claims that most young Israelis are “entirely ignorant” of this aspect of Jewish history. Israeli officials hope that this national recognition will spark international recognition of this issue, and the refugees and their descendants will finally be compensated for their hardships. Jews in 1948: 140,000. Jews in 2018: <50. On the eve of WWII, there were around 120,000 Jews in Algeria. In 1934, incited by events in Nazi Germany, Muslims rampaged in Constantine, killing 25 Jews and injuring many more. Starting in 1940, under Vichy rule, Algerian Jews were persecuted socially and economically. In 1948, at the time of Israel’s independence and on the eve of the Algerian Civil War, there were approximately 140,000 Jews living in Algeria, of whom roughly 30,000 lived in the capital. According to the State Department, there is now fewer than 100 Jews in Algeria and there are no functioning synagogues in the country. Jews in 1948: 75,000. Jews in 2018: 100. The first Nationality Code was promulgated by Egypt in May 1926 and said that only those “who belonged racially to the majority of the population of a country whose language is Arabic or whose religion is Islam” were entitle to Egyptian nationality. This provision served as the official pretext for expelling many Jews from Egypt. Israel’s establishment led to further anti-Jewish sentiments. Between June and November 1948, bombs set off in the Jewish Quarter of Cairo killed more than 70 Jews and wounded nearly 200, while another 2,000 Jews were arrested and had their property confiscated. Rioting over the following months resulted in more Jewish deaths. In 1956, the Egyptian government used the Sinai Campaign as a pretext for expelling almost 25,000 Jews and confiscating their property while approximately 1,000 more Jews were sent to prisons and detention camps. In November 1956, a government proclamation declared that “all Jews are Zionists and enemies of the state,” and promised that they would be soon expelled. Thousands of Jews were ordered to leave the country, allowed to take only one suitcase, a small sum of cash, and forced to sign declarations “donating” their property to the Egyptian government. By 1957 the Jewish population had fallen to 15,000 and in 1967, after the Six-Day War, there was a renewed wave of persecution and the community dwindled to 2,500. By the 1970’s, after the remaining Jews were given permission to leave the country, the number of Jews feel to just a few hundred. Today, the community is on the verge of extinction with fewer than 100 Jews remaining in Egypt, the majority elderly. Jews in 1948: 135,000. Jews in 2018: <10. As of 2008, the Jewish Agency for Israel estimated that there were only seven Jews remaining in Iraq while Baghdad’s Meir Tweig synagogue, the last synagogue in use, was closed in 2003 after it became too dangerous to gather openly. The State Department reported in 2011 that anti-Semitism is still widespread in both state-owned and private media outlets and Holocaust denial is often glorified. Jews in 1948: 38,000. Jews in 2018: 0. At the time of the Italian occupation in 1911, there were approximately 21,000 Jews in the country, the majority in the capital Tripoli. By the late 1930s, fascist anti-Jewish laws were gradually being enforced and the Jewish community was subject to terrible repression. Yet, in 1941, the Jews still accounted for a quarter of Tripoli’s population and maintained 44 synagogues. 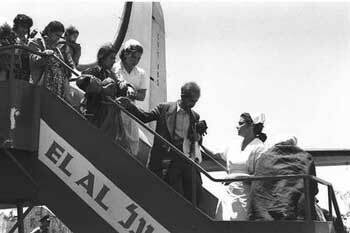 Thousands more Jews fled to Israel after Libya became independent in 1951 and was granted membership in the Arab League. A law passed in December 1958 ordered for the dissolution of the Jewish Community Council. In 1961, a special permit was needed to show proof of being a “true Libyan” and all but six Jews were denied this document. Jews in 1948: 265,000. Jews in 2018: 2,150. The Jewish community now numbers between 2,000 and 2,500 and while the government is one of the most friendly towards Israel, the Jewish community is still the target of sporadic violence. On a Saturday in May 2003, for example, a series of suicide bombers attacked four Jewish targets in Casablanca, though fortunately no Jews were killed. In a show of kindness, the government subsequently organized a large rally in the streets of Casablanca to demonstrate support for the Jewish community and the king reasserted his family’s traditional protection for the country’s Jews. Jews in 1948: 30,000. Jews in 2018: 100. Over the next few decades, those Syrian Jews that remained were in effect hostages of a hostile regime as the government intensified its persecution of the Jewish population. Jews were stripped of their citizenship and experienced employment discrimination. They had their assets frozen and property confiscated. The community lived under constant surveillance by the secret police. Freedom of movement was also severely restricted and any Jew who attempted to flee faced either the death penalty or imprisonment at hard labor. Jews could not acquire telephones or driver’s licenses and were barred from buying property. An airport road was paved over the Jewish cemetery in Damascus; Jewish schools were closed and handed over to Muslims. The last Jews to leave Syria departed with the chief rabbi in October 1994. By the middle of 2001, Rabbi Huder Shahada Kabariti estimated that 150 Jews were living in Damascus, 30 in Haleb and 20 in Kamashili. while two synagogues remained open in Damascus. According to the US State Department, there were about 100 Jews left in country as of 2011, concentrated in Damascus and Aleppo. In 2014 there were 17 Jewish individuals left in Damascus and more than likely none left in Aleppo. Only 9 of these 17 individuals are male, so the community comes up one short of a Quorum (a minyan of 10 adult men required to perform certain religious obligations). All of the Jewish individuals left in Syria in 2014 are over the age of 60. Contact between the Syrian Jewish community and Israel is prohibited. Jews in 1948: 105,000. Jews in 2018: 1,050. Jews in 1948: 63,000. Jews in 2018: <50. In 1947, after the partition vote on Palestine, the police forces joined Muslim rioters in a bloody pogrom in Aden, killing 82 Jews and destroying hundreds of Jewish homes. The pogrom left Aden’s Jewish community economically paralyzed, as most of the stores and businesses were destroyed. Early in 1948, looting occurred after six Jews were falsely accused of murdering two Arab girls and the government began to forcefully evict the Jews. 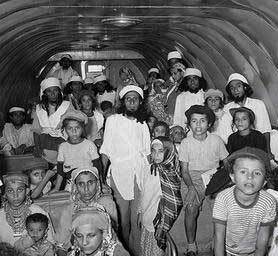 Between June 1949 and September 1950, Israel ran Operation “Magic Carpet” and brought virtually the entire Yemenite Jewish community - almost 50,000 people - to Israel as refugees. Today, there are no Jews in Aden and there are an estimated less than 90 Jews in Yemen. The Jews are the only indigenous non-Muslim religious minority and the small community that remains in the northern area of Yemen is tolerated and allowed to practice Judaism. However, the community is still treated as second-class citizens and cannot serve in the army or be elected to political positions. Jews are traditionally restricted to living in one section of a city and are often confined to a limited choice of employment. To read a PDF file about Jewish refugees from Arab countries put together by Ashley Perry, the Director General of the Knesset Caucus for the Reconnection with the Descendants of Spanish and Portuguese Communities, please click here. Sergio DellaPergola, “World Jewish Population, 2018,” American Jewish Year Book 2018, Arnold Dashefsky and Ira M. Sheskin, Eds., (Springer Nature Switzerland, 2019), pp. 361-449, available at www.jewishdatabank.org.